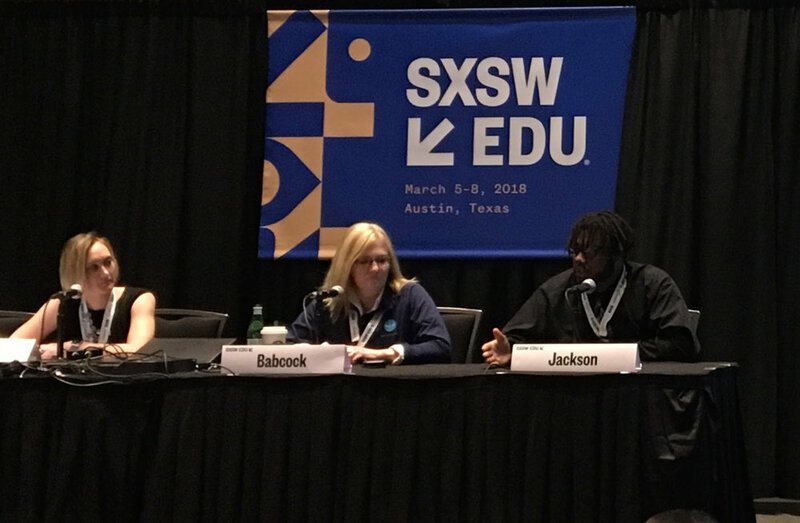 In March, Demarkes Jackson, a student at Boston Day and Evening Academy (BDEA), traveled to Austin, TX to participate in a panel titled, “No, I Won’t ‘See You at McDonalds’ & Other Stories” at SXSW EDU, a conference and festival that “cultivates and empowers a community of engaged stakeholders to advance teaching and learning.” Demarkes was joined by leaders from around the country who are designing and launching alternative high schools for students who are off track for graduation. This was an exciting opportunity for Demarkes, and a proud moment for the BDEA Instructional Leader who accompanied him to the conference, Adrianne Level. Both Demarkes and Adrianne are members of a design team at BDEA that has been hard at work this year creating a new pilot program, supported by the Barr Foundation and designed to consider the needs of young men of color who enter BDEA far from graduation. The design team’s work has resulted in a new model that will break the day into two modules, with project and problem-based activities for part of the day, and self-paced academics for the other. For Adrianne, who is an alumna of the first iteration of the Perrone-Sizer Institute for Creative Leadership (PSi) in 2015-2016 (then the Institute for Creative Educational Leadership at Boston University), the BDEA design team has put into action all that she studied and experienced in PSi. “Design thinking has been at the center of our work. We looked at the data and at what’s working for Black and Latino boys. We made sure all stakeholders where part of the process, and most importantly, we designed with them rather than for them.” Demarkes’ leadership in the design process was in evidence at SXSW EDU and in the outcomes of BDEA design team. For Adrianne. the lifting of his voice is a powerful validation of her approach—honed through her work with PSi—to educational leadership.